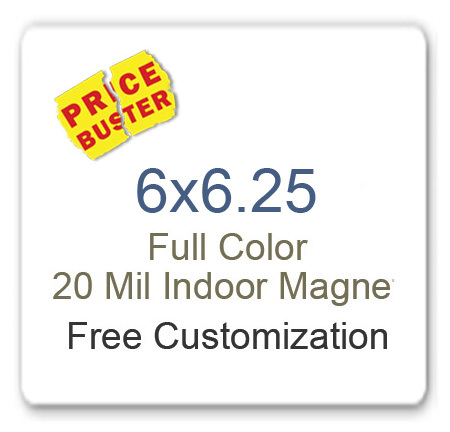 You can employ these large, almost rectangle and square magnets for announcing monetary benefits of a purchase. People are definite to notice it due to its large square size. For example – You can encourage high discounts, retail best buy pricing, holiday sales or anything, which will trigger an immediate action. Use 6×6.25 magnets for displaying your social side such as showing your affiliation with some social causes or showing your support for any charity event in your area. Customized magnets can be considered for fundraisers because they remain largely affordable. If you are sourcing your rectangle and square magnets from an eCommerce store selling only made in USA magnets, perhaps there are chances that you are saving on art setup, online design proof and shipping. In addition, they allow you to make bulk savings with exciting price margins. Doesn’t that sound exciting? Just imagine the increased traffic at your store or eCommerce store after the distribution of emotionally enriched customized fundraiser magnets. People would be excited to buy such informative and emotional personalized magnets at smaller prices. They would retain them as a matter of pride and advocate it to their loved ones and others. Similarly, you can target sports lovers from vast segment by gifting them customized 6×6.25 sports schedule magnets. People would be happier to retain such large square magnets over their refrigerator door and they would crane their necks to refer schedules, when match is in progress. Customized 6×6.25 magnets can be offered as a everyday reference token ( read calendar magnets). People would be happier to retain such informative piece of information handy. Although there are watches and smart phones, which can offer date information instantly, but retaining a full color promotional magnet over the refrigerator door can be exciting. Most people make their important decisions over a morning cup of tea. They set their day for maximum efficiency and now they can do it by referring over personalized calendar magnets. You can use 6×6.25 magnets in many other creative ways for buying attention of the crowd, whom you are targeting. Feel free to offer customized magnets as a tradeshow giveaway or mailer because people would love them instantly. If you are printing them with information, which builds enthusiasm, then you are going to play long innings with this investment.